The best known and most widespread among the many schools of the Tibetan tradition today is the Gelugpa, sometimes simply referred to as the Yellow Hat school. It is a school of Buddhism founded by Je Tsongkhapa (1357–1419), one of Tibet’s greatest scholars. Pabongka Rinpoche was born in 1878, at a town called Tsawa Li in the Yeru Shang district of the state of Tsang, north of Lhasa in Tibet. His full name was Kyabje Pabongkapa Jetsun Jampa Tenzin Trinley Gyatso Pel Sangpo, which translates as the “Lord Protector, the one from Pabongka, the venerable and glorious Master whose name is the Loving One, Keeper of the Buddha’s Teachings, Ocean of the Mighty Deeds of the Buddha.” He is also popularly known as “Dechen Nyingpo,” which means “Essence of Great Bliss” and refers to his mastery of the secret teachings of Buddhism. Pabongka Rinpoche is best known for his classic introductory text, Liberation in the Palm of Your Hand, which is based on a 24 day teaching he gave in 1921 at Chuzang Hermitage near Lhasa to a mass gathering of monks, nuns and lay people, and his commentaries on various books by Je Tsongkhapa. He was also the root Lama of both Kyabje Ling Rinpoche and Kyabje Trijang Rinpoche, the two tutors of the present Dalai Lama, and the teacher of most of the other Gelug Lamas who have been bringing the Dharma to the West since they fled Tibet in 1959. 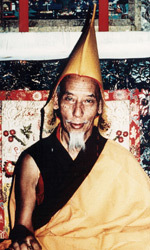 His Holiness Trijang Kyabje was the Junior Tutor to H.H. the 14th Dalai Lama. 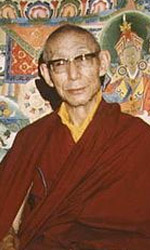 Coming from a devout family, Trijang Rinpoche’s father Tserin Dondrub, descended from the uncle of the 7th Dalai Lama, Losang Kelsang Gyatso, and was knowledgeable in religion. His mother, Tsering Drolma, came from the village of Gungtang Nanggong. Considered an emanation of Vajrayogini, Trijang Rinpoche’s first incarnation was that of chariot driver Chandra. It was Chandra who escorted Buddha Shakyamuni out of the palace for the final time, to renounce his worldly position to become a Buddha. Chandra exchanged his clothes with Shakyamuni before bidding him goodbye, thus leaving him to begin his spiritual path. Trijang Rinpoche’s early life follows that of many other reincarnated great beings. Miracles were witnessed at the time of Trijang Rinpoche’s birth in Gungtang in the winter of 1901 – it is said that an apricot tree flowered and bore 30 apricots at his birth even though it was deep winter. Before he could walk, he showed great interest in religious paintings, statues, and Tantric ritual implements; and would make as if he was reciting prayers. News of his precocious actions reached Ngarampa Losang Tendar and Geshe Gendun Dragpa Chen. They were responsible for finding the reincarnation of Losang Tsultrim Palden, who was the Ganden Tripa and former Trijang Rinpoche. Upon hearing of the child, they travelled to his birth place of Gungtang – on seeing them, he yelled out: “Gendun Dragpa!” and later asked him to wash his feet. Gendun Dragpa used to wash the feet of Losang Tsultrim Palden when he had rheumatism. The child also correctly identified the former Trijang Rinpoche’s private Buddha statue, rosary and bowl from among a selection. This and other signs led the search party to conclude that they had probably found the correct incarnation. At the age of 5, Trijang Rinpoche met Pabongka Rinpoche and received his first teaching, set of Initiations into Manjushri from the Secret Lineage of Tsongkhapa. Pabongka Rinpoche took great delight in caring for the young child. Their strong connection was to last a lifetime and he became Pabongka Rinpoche’s closest disciple. Trijang Rinpoche received many profound teachings from Pabongka Rinpoche, including the oral instructions of many secret Gelugpa lineages; and he also engaged in Tantric retreats. In 1967 Trijang Rinpoche taught Hundreds of Deities of the Joyful Land (Gaden Lhagyama) to hundreds of students in Dharamsala, and in 1970 he gave similar teachings in Bodhgaya. In 1932 he gave more extensive teachings at Ganden Shartse and Jangste monasteries. 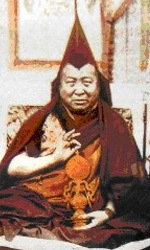 Kyabje Trijang Rinpoche was the root lama of many Gelug Lamas who teach in the West including Zong Rinpoche, Geshe Rabten, Lama Yeshe, Lama Gangchen Rinpoche and Geshe Kelsang Gyatso. The Dalai Lama is the reincarnation of Gendun Drupa (1391-1474), who was a direct pupil of Lama Tsongkhapa. Gendun Drupa founded the great monasteries of Drepung and Tashillhunpo, and during his life he was among the most respected scholars in Tibet. 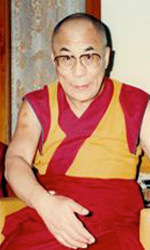 The current Dalai Lama, Tenzin Gyatso, is the 14th reincarnation. He was born in 1935, two years after the death of the 13th Dalai Lama. When he was three years old, signs and visions led senior monks to find the little boy who was named Lhamo Dhondup at that time, living with his farming family in northeastern Tibet, and declared him to be the 14th Dalai Lama. His Holiness the Dalai Lama is a man of peace. In 1989 he was awarded the Nobel Peace Prize for his non-violent struggle for the liberation of Tibet. He has consistently advocated policies of non-violence, even in the face of extreme aggression. He also became the first Nobel Laureate to be recognized for his concern for global environmental problems. His Holiness has travelled to more than 67 countries spanning 6 continents. He has received over 150 awards, honorary doctorates, prizes, etc., in recognition of his message of peace, non-violence, inter-religious understanding, universal responsibility and compassion. He has also authored or co-authored more than 110 books. Zongtrul Jetsun Losang Tsondru Thubten Gyaltsen or Venerable Kyabje Zong Rinpoche, as he is known to countless ordained and lay disciples, was a great scholar and tantra master of the Gelugpa lineage born in Kham in 1905. Following various unusual observations accompanying his birth, he was declared as the rebirth of Tenpa Püntsok, a local monk and tulku. It is said that already in an early stage of his childhood he performed various magical miracles and was able to invoke a female naga goddess (mystical serpent being) in a nearby lake. In 1916 he went to Lhasa to study the dharma at Shartse college, where he studied the sutras of the Prajnaparamita, Madhyamika, the Abidharma and the Vinaya. Zong Rinpoche received his full ordination from the Thirteenth Dalai Lama at the Potala Palace, and soon after that, during even his first year at the monastery, his teachers began to see in the young lama the makings of a talented debater. During an all-night debating session on Pramana between Ganden’s twin colleges of Shartse and Jangtse, he surprised the senior Jangtse scholars with the depth of his debating skills. Some months following his studies, Zong Rinpoche was appointed abbot of Ganden Shartse Monastery, the seat of which he held for nine years. His abbotship is still remembered for many remarkable achievements, among others, Ganden Shartse gained new heights of exemplary monastic discipline (which he held closest to his heart) and scholarship. Also noteworthy was the definite improvement in the administrative structure of the monastery. Stung early by the difficulties the poorest members faced, he successfully introduced reforms that went a long way to improve their lot. After resigning from the seat of Abbot after serving the monastery for more than nine years, Rinpoche went on a long pilgrimage to Tsari, one of the places where Tsongkhapa went for penance. Zong Rinpoche first came to teach in the West in 1978, at the request of Lama Thubten Yeshe. He had been asked by him twice before, but had refused. Altogether he travelled to the West three times, the last two times staying extensive periods in America and Europe. Zong Rinpoche had many disciples in Tibet, India and the West. He was the teacher and root Guru of H.E Tsem Tulku Rinpoche, as well as a teacher of Lama Zopa Rinpoche, Spiritual Director of the FPMT. He was also one of Geshe Kelsang Gyatso’s teachers. Zong Rinpoche passed away at 9:30 in the morning, Thursday November 15, 1984 at his monastery Ganden Shartse, in Mundgod, South India without without manifesting any signs of illness. The most interesting thing is that Rinpoche had marked the date of his death and the date of cremation in his personal dairy prior to his death. His new incarnation was born in the Kullu valley (place in Northern India), later on duly recognized by His Holiness the Dalai Lama and enthroned at Ganden Shartse monastery in India. Like his previous incarnation he also shows many heart moving signs confirming that he is the real Zong Rinpoche and has only changed his physical outlook. It is remarkable that one of the things the previous Zong Rinpoche did during his last visit to the United States was to buy a bag of children’s toys.